Resistance, capacitance, inductance, crystal, LED, diode, triode, multi-pin IC, etc. Please noted that the Radiation Detection Report is according to which 21 CFR Subchapter J is applicable. The international acceptable standard is <1 uSv/hr. The X-1000 SMD components counting machine actual radiation reading is 0.3 uSv/hr which is same as the environment normal rate. So it is qualified. 1. Long time for manual counting; 2. High labor cost for input. 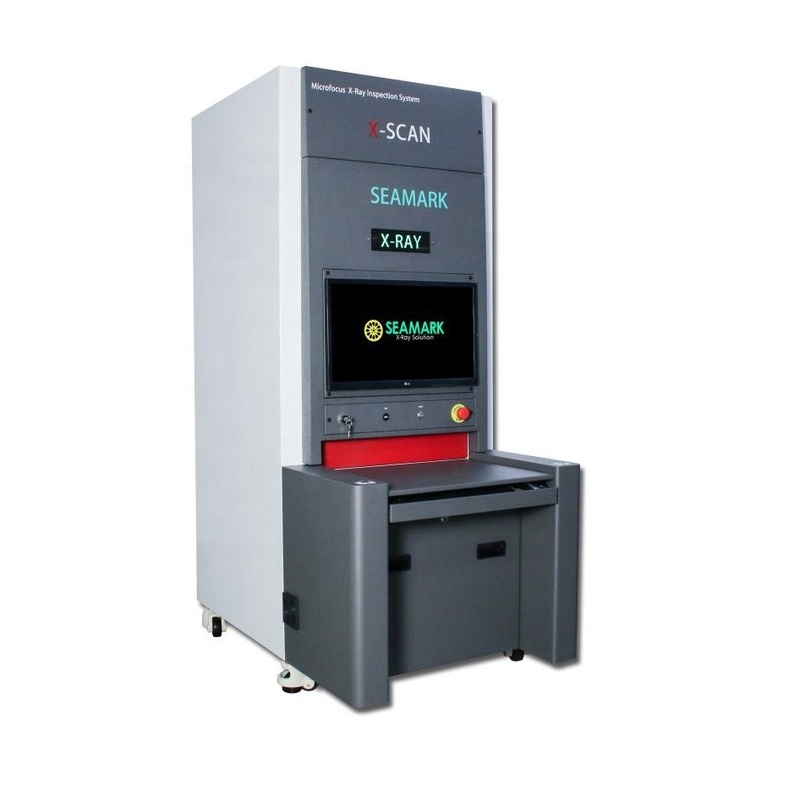 The Seamark ZM X-ray Component counting machine can measure hundreds to 100,000 disk chips about 15 seconds, and the disk diameter ranges from 180 mm to 380 mm. The conveyor belt movement provides a 100% automatic detection environment. 1. 13 years experience of LED BGA SMD rework station and X-ray inspection machine. 2. All X-RAY models with CE and FDA approved. 3. High reputation around the world. 4. Professional service and technology support. 5. Competitive price with good quality. Welcome to contact us to discuss with us the X-ray machine you want, we’ll be glad to accept customized order. 1. Training: Free training for all types of Microfocus X-ray inspection machine & BGA rework station. 2. Warranty: We offer free warranty within the first year, after the first year, the spare parts and service fees will be on buyers account. 3. Services hours: Before-sales and after-sales services is 24hours/7days. Your inquiry will be replied within 8 hours. 4. Customized service: Can provide customized services according to customers’ requirement. 5. Give great discount to AGENCY to ensure agents profit. Shenzhen Zhuomao(Seamark ZM) Technology CO., Ltd, a 13-yearprofessional manufacturer and exporter of LED BGA rework station, X-ray SMD component couting machine, X-ray inspection machine. We are a high-tech enterprise including R&D, production, Sales and After sales service. Currently, our machine have been sold around Europe, Asia, Australia, Oceania and Southeast Asia, Middle East and other countries and regions. We are the vendor of FOXCONN, HUAWEI, FLEX, NVIDIA, LENOVO, PANASONIC, HISENSE, SANMINA-SCI, GIGABYTE, SAMSUNG, and so on. High quality assurance is our task and also what we are doing now. 1. About the Package, is it safe during the shipping ? The X-ray machine are packed in solid wooden box with foam, sticks and band to fix inside. It is safe enough when shipping. 2. About the Transportation, which way and how many days will the machine arrives? 3. About the Warranty, how long and how to do the after-sales service ? 1 year warranty free for spare parts, and whole life technical support. We have professional technical team, for any question, assistant videos are also provided. 4. About the Operation, if I have no experience, can I also operate it well ? Our X-ray inspection machine is designed to use easily, normally it will take you 2-3 hours to learn how to operate, if you are a technician, it will be much faster to learn. We will provide the English user manual for free , and the operation video is available. 5. About the Training, will you provide the free training ? Yes, we will arrange the free training and installation service for you. 6. About the Payment, which way is better ? We accept the payment terms: T/T, Bank transfer, Western Union, Money gram, PayPal, L/C etc. Others payment ways is negotiable. For more details of the 2018 newest SMD components counting machine SMD chip counter, please feel free to inquire us. We’re 24-hour online for you. I will be your reliable partner. Contact me if you interested in our products.